Sooner or later many people understand that the game has started to take too much space in their life and has become uncontrollable. 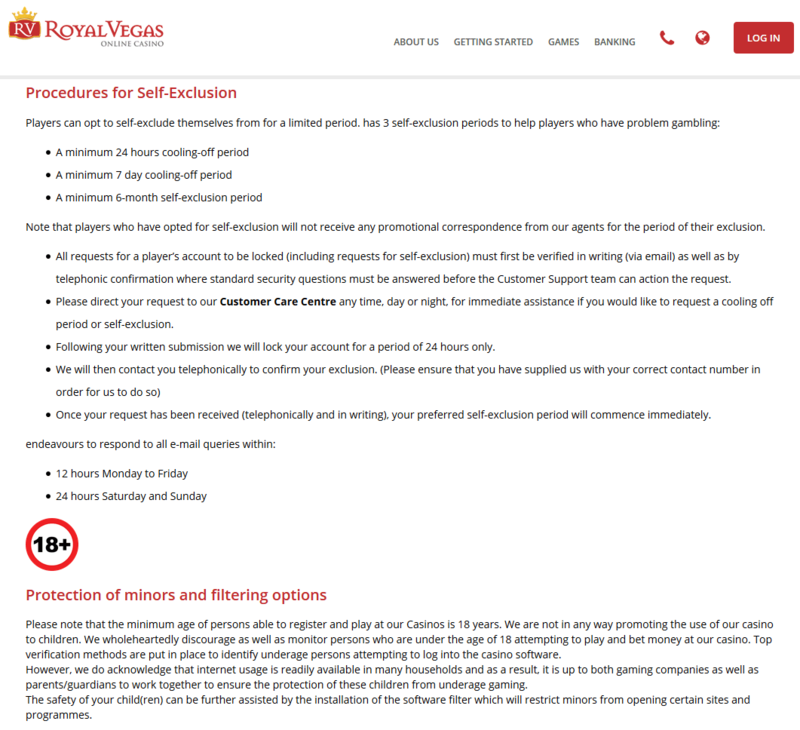 According to the licenses’ regulations and the requirements of the European Union, every player, who has certain problems with gambling games and suffers from the dependence on them, should be given an opportunity to limit the access to the games and make Self-Excluding, as well as to set up limits for the deposits and losses. Every online casino should warn the gambler about the harm of the gambling games before he/she starts to use it. There should also be a special function on the website, which allows self-excluding. Otherwise, such function must be available via the users’ support chat. It is always possible to contact the support via chat or email and ask to block the account for a definite period. If you indicate that you suffer from the dependence, the majority of casinos might block your account for quite a long period of time. This is the easiest and most comfortable way to control yourself and your finances in the game. The player can set up desirable limits by means of the interactive menu or with the help of the operator. For example, the gambler sets up a weekly limit for the deposits, which totals $100. Thus, the favorite recreation won’t be lost, but he/she will be more careful with the money. Temporary self-excluding is a full limit of access to the game for a fixed period. This is the most frequent way, but it is available not in all the casinos. In the majority of cases, the gambler can define the time of the access limit. For instance, for a day, week, month, half of a year, etc. Life self-excluding is the last and decisive way for the people, who feel discomfort playing gambling games and start experiencing psychological and financial difficulties. Depending on the honesty of the establishment, the blocked account might be reopened. It is required thinking everything over before to make life self-excluding. The reasons are simple: there are thousands of casinos on the Internet. If you block an account in one of them but do not give up playing in general, you can register in the other one after some time. However, it might be hard to find a good alternative for the reliable casino, you have quit. It should be also mentioned that on the casino website, there is not only superficial information about the harm from the gambling games, but also links to the other resources, which are able to help fight against the dependence.